Spending all my time with you. There's nothing else I'd rather do. Thanksgiving wasn’t over the river and through the woods but it was at grandmother’s house. Well, Pappy’s house and that’s close enough. Pappy’s ‘nother one house as the kids said. The mountain house is just big enough but when we all go, the walls close in and no matter how hard we try, things just get in a mess. A beautiful mess, though, because we are enjoying each other. There were some people missing and it would have been even better if they’d been there. But they were in our thoughts, and we were in theirs. It’s fun, it’s tiring, it’s caring and it’s sharing. It’s family. Belle...still and quiet? What's up with that!?! Helping Pappy and loving it! This sums it up!!! Thanks for Thanksgiving 2010. I hope everyone got to spend time with people who are important to them. Be thankful for the wonderful things in your life. There was some yarn play during the holiday. I took a bunch of hanks that needed to be wound. I have a swift and a ball winder. I took them to the mountain house and while there was room I set it up on the counter and wound some of the hanks. The boys were mesmerized. Of course they wanted to help so with a little guidance they wound yarn too. I didn’t get finished with all I had but I got a good start. Then I wondered why I have so much. Caleb says, "All your yarns is rainbow colors Mames!" I also made a couple of Christmas scarves. They are just scraps but I like how they look. And they are lengthwise so they are fast. The kids liked them so I made two more little ones. I also finished the Gaiter and started on Ty’s scarf. I knitted on the way home in the dark and got about a foot done. Surprisingly I can do this pattern in the dark with not too many problems. Ty's Gaiter and scarf in the works. Knitayear is also still going on. I did get behind up there but caught up for this post and have one more November post to go. Then maybe I can be caught up for a while. Doubtful! Day 236, November 22 was a little frenzied. I was trying to get things caught up at work and also get things going at home so we could leave. I chose a green yarn with little ribbons hanging off of it. Day 237, November 23, I was getting ready to go. Then plans changed and we weren’t going that day. I shut down. Then plans changed and we were going that day. Make up your mind!!! But I’m ready, regardless. It’s my good friend’s birthday today too. And she’s older now! I choose maroon worsted with colored flecks. November 24, day 238 was a good day. I’m glad to be at the house. Glad for the mountain air and the trees. I’m not as glad for the stairs and the two hundred times going up and down to unload! I chose dark green wool for the trees. It’s day 239, Thanksgiving, November 25, and I’m thankful we can all be together. I wish the boys were here and that Dustin was home but I know it will come soon enough. It would have been fun to have Junie and mom and dad too, but they’ll be there Christmas. We didn’t really plan a Thanksgiving supper but the turkey was in the smoker and it took a little longer than expected. We had a sausage snack to tide us over then had a wonderful supper. It was all the usual favorites. I made a standby that we call Sour Cream Salad and the little guys ate it like there was nothing better. I like it when that happens! I chose Artist Fleece wool silk in orange, green and blue. Day 240 was the calm after the storm. November 26 is Black Friday but we skipped it. When they start opening stores at 3:00 am or midnight it’s not fun anymore. We occasionally went for some things in the past, ate breakfast out and came home. That wasn’t too bad. But to stay up and out all night? Well, it’s not worth the money saved to me. We hung around the house and just relaxed. I chose yellow bamboo. Day 241, November 27, Callye and I ventured out. We were lucky and found some leftover Black Friday things without the crowd and the early hours! We also went to a dollar store and just had fun finding little stocking stuffers and the like. I chose Flame Trend superwash in a color called party. It’s really rainbow colored but I could only use a bit so it’s bright green. I feel fortunate and very lucky that we had this holiday together. I think I already said it but the cherry on the Sundae would have been the boys being able to be there. The wild times, the messes…the memories made. That’s what counts. Your posts always make me smile! 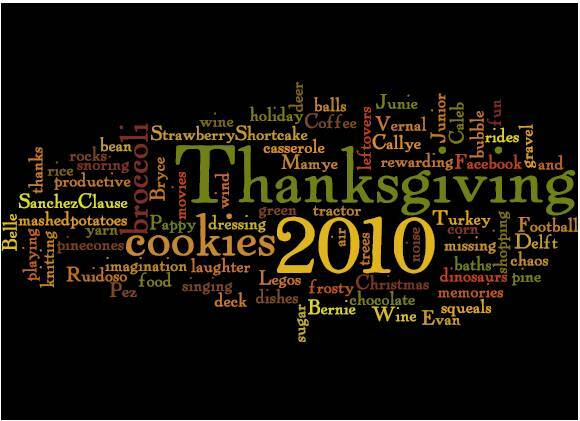 Love the Thanksgiving 2010 picture. How'd you do that? Glad you had a good Thanksgiving! It's great to get together with family and friends. Your Christmas scarves are great, so festive! You must teach me how to knit in the dark too, lol, I could get so much more done when I can't sleep at night! Thanks Bev! The picture is a 'word cloud' in education terms. It's a free app online though, that makes cool pictures. It's an algorithm that makes the picture according to how many times the word is entered. So to make Thanksgiving big I had to put it in a few more times than the other words. 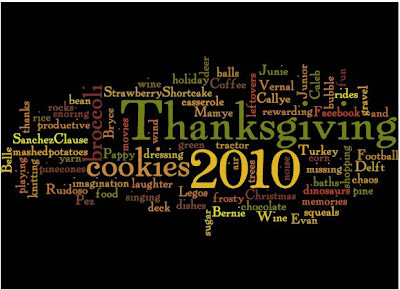 It's at http://www.wordle.net/ Play! You need to get one of those little book lights that hooks to your shirt...or your jammies, Sinéad! Have you heard of Friday Night Lights? Well, that's where we live. High School Football has capital letters it's so important! But travel is the issue because everything is so far apart. I drive 100 miles a day round trip for work! Anyway, lots of road time and the time of the garter scarf led me to knit in the dark. If it's really simple I can do it by feel. I tried to crochet though, and that doesn't work!